This small program can be used to create bootable USB devices with Windows operating system. It can be useful when you need to install a fresh Windows operating system on your computer. A bootable device such as USB or DVD is recognized by the computer at start and you will be able to make the installation. After you create a bootable USB, you need to change the boot order in computer's BIOS and put the USB first. 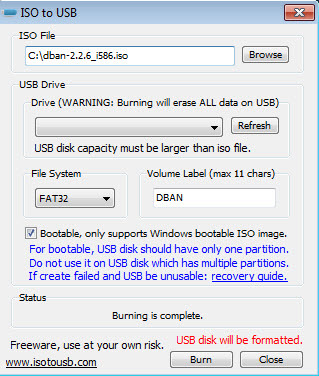 ISO to USB will format the USB device (FAT, FAT32, NTFS ..) and you can change the name of USB device as you wish. Cons: You can make bootable USB containing only Windows operating system. Conclusion: Good program to create bootable USB with Windows OS, before installing this operating system from an USB. ISO to USB is available as free download for Windows 32-bit and 64-bit. ISO to USB is 100% clean and safe to install. You can see the test results here.